Mere days before 2016 comes to a close, Marvel’s “summer” event series Civil War II has released its last issue. 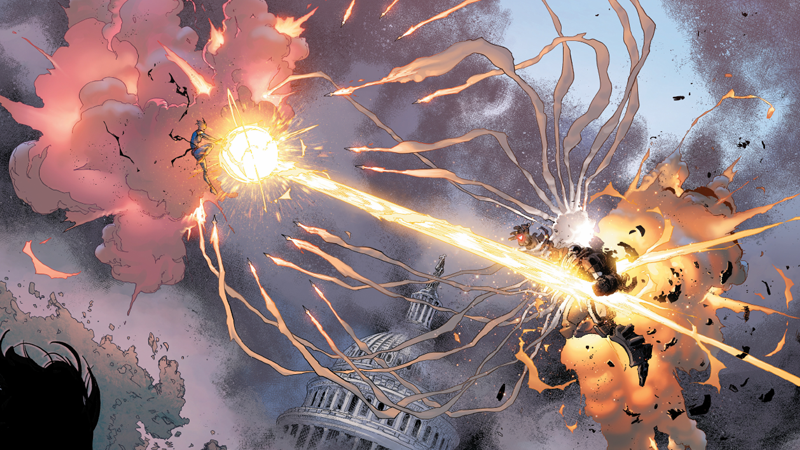 But Civil War II wasn’t going to go down without at least adding a few more twists to the future of the Marvel Universe... and oh boy, did it add some. So Tony Stark is dead. For now. Sort of. We’ll get to that after seeing the final issue’s other wrap-up point: the “death” of Ulysses, the future-predicting Inhuman who kicked the whole event off (who could obviously never stay around permanently in the Marvel universe given his powers). Basically, he evolves into a higher consciousness, taking his place alongside the legendary cosmic character Eternity as part of the fabric of existence himself. The more nebulous visions are by far the most interesting—with one hinting that the potential fatal brawl between Miles Morales and Steve Rogers could still happen, another teasing the return of Ultron, and a third offering a future where it appears Odinson has regained the use of Mjolnir and is once again Thor. But, like basically anything Ulysses actually did in Civil War II, they’re lacking in any sort of substance or context for us as readers to care about them. Ulysses hasn’t really done anything other than serve as a catalyst for Tony and Carol to have an ill-conceived argument, and now he’s just up and vanished off into the cosmic ether. So what remains? Well, Civil War II #8 has one more “trick” up its sleeve to reveal with the fate of Tony Stark, now that Ulysses is conveniently out of the way. For the past few months, we’ve been told that Tony Stark is dead—or at least that while his mind lives on as an A.I., his body is gone for good. But Civil War II #8 shows us that that is very much not the case. Whatever process Tony did to turn his consciousness into an A.I.—one now in the hands of his successor, Riri Williams—also involved doing something to his body that essentially leaves him in a coma, under the watchful eye of Hank McCoy and SHIELD. They’re currently too scared to do anything but keep the barely-still-alive Tony in stasis, but it means that Civil War II’s biggest twist isn’t actually that big at all. It’s the latest in a long line of conveniently cheap comic book “deaths” that treat the afterlife as little more as a revolving door. It’s a “gotcha!” moment that leaves you more annoyed than intrigued, because we already know what it means for the future of Marvel’s comics: Tony Stark will be able to come back as Iron Man pretty much whenever it suits Marvel—maybe, perhaps, just in time for a certain upcoming Avengers movie. It casts a shadow over everything Riri Williams is currently doing in Invincible Iron Man, because the specter of “break glass to revive Tony Stark” hangs over that series in the context we have now. For a series that has been about looking at potential futures, in the end Civil War II relied on the worst tricks of the past—both in terms of its predecessor, the original Civil War, and the superhero comics’ ever-lengthening history of “killing off” characters for cheap thrills. In the final battle between Carol Danvers and Tony Stark, the real loser was the audience.